New flexible air conditioning systems. Exposed services with suspended LED lighting. Floor to ceiling heights of between 2.9m - 4.3m. Third floor terraces at Chapter House with panoramic views across London. Cycle spaces, lockers and showers. Two buildings for rent within 100 meters of Old Street roundabout. A former Victorian schoolhouse brought to the vanguard of 21st century design sits side by side with its newly developed neighbour. A pairing which caters fully for the needs of the modern office occupier, having been considered in full, from the ground up, Chapter & Verse. 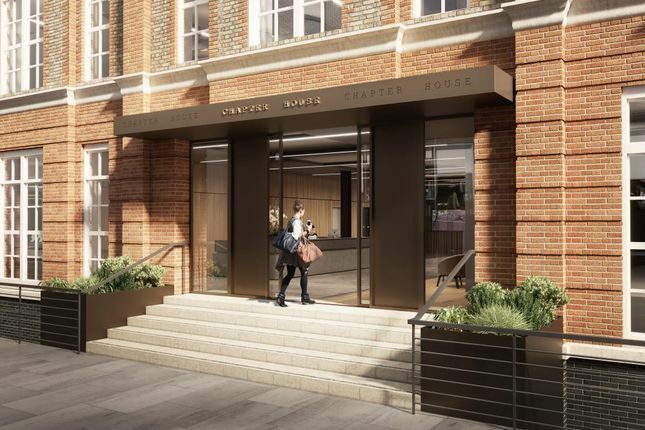 Chapter House: Contemporary refurbishment and extension of a former Victorian school house providing approximately 34,000 sq ft of office accommodation. Verse Building: A new development designed by world renowned architects BuckleyGrayYeoman providing 17,000 sq ft of office accommodation. More than a fashionable hot spot, Old Street is now seen as the vibrant and diverse heart of a creative cluster of businesses in London. Since the launch of the Government’s “East London Tech City” initiative in November 2011, the area accelerated and positively thrived. The “Silicon Roundabout” is fast becoming the major hub for media agencies and tech firms with a digital edge. Chapter & Verse are serviced by the Elizabeth Line via Liverpool Street station (Moorgate entrance), approximately 10 minutes walk away. New lease available direct from the Landlord for a term by arrangement.